Many Asian families of children with rare diseases such as Osteogenesis Imperfecta (OI) face different challenges aside from the daily worries of other Asian families (food, shelter and education to name a few). A rare disease is a lifetime challenge in many aspects: financially, emotionally, physically, psychologically and sad to say, for some, spiritually. Looking back, when my son and daughter were diagnosed with Osteogenesis Imperfecta, I could say that we had no choice but to mature as individuals and as a family. It was hard to accept at first, but we realised it is easier to accept than to resist. Acceptance is the first step in rising above a challenge. 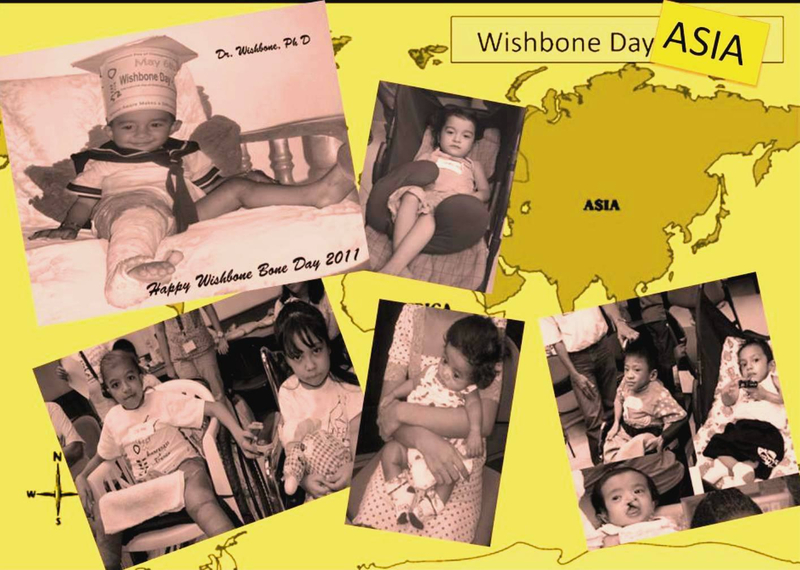 As I go along my volunteer work for Wishbone Day as Regional Liaison for Asia, the realities of third world countries come crashing in. It is not just the situation of being resource-poor that affects the families but more than anything it is the culture, the impact of society and how it affects the family's way of thinking. 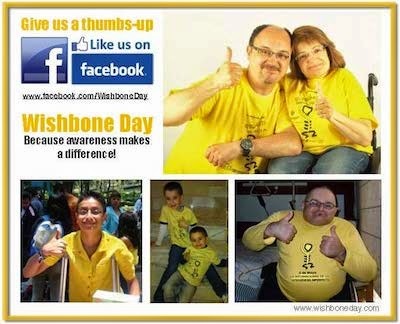 The International OI community led by Wishbone Day is working together in raising OI awareness which can eventually lead to finding ways for support and uplifting the families in resource poor countries. "Realistic optimism" is the key to Positivity. The Challenge of Making a Difference: Most families have "accepted their fate" but did not rise above the challenge for different reasons that I cannot elaborate. They've done so for many years and this has affected their way of life and thinking. This is the challenge that we must work on. I know this is hard and will take a long time and it will definitely not be in time for Wishbone Day 2012 (though it may be possible for quite a few, keeping my fingers crossed!) Some may never be up for change but who knows? An additional ounce of Positivity won't hurt. We still have more Wishbone Days to look forward to. I am accepting this challenge of making a difference. Wholeheartedly. With the support of the Rotary Club of Dee Why Warringah together with CLAN, Wishbone Day invites Rotary Clubs, organisations and individuals worldwide to join us in raising positive awareness and support for families across the world. Are you up for the challenge?